Select a scent Caribbean Lavender Chamomile White Tea and Ginger Fragrance Free Lilac Spiced Mahogony Blueberry Jasmine Spearmint e.o. Peppermint e.o. Lavender e.o. Patchouli e.o. Frankincense e.o. Tangerine e.o. Select an option Caribbean Lavender Chamomile White Tea and Ginger Fragrance Free Lilac Spiced Mahogony Blueberry Jasmine Spearmint e.o. Lavender e.o. Patchouli e.o. Frankincense e.o. Tangerine e.o. Peppermint e.o. This is a perfect gift for anyone! Our lotion sticks not only softens dry, cracked skin but helps repair the skin as well. The organic coconut oil and organic sweet almond oil we use in our Lip Moisture, will moisten and protect your lips for hours at a time. 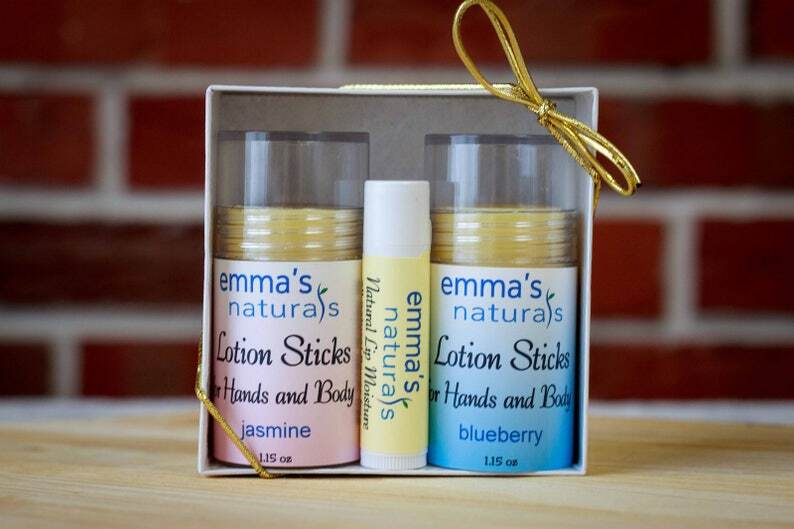 Each box contains 2 lotion sticks and 1 Lip Moisture. Each box can be tailored to your favorite scents! Our products contain only five natural and organic ingredients. This means we leave out unwanted parabens, preservatives, and fillers. DUE TO LACK OF VARIATIONS PLEASE SEND ME YOUR CHOICE OF LIP MOISTURE IN THE SPECIAL MESSAGE BOX. CHOICES INCLUDE: VANILLA, COCONUT LEMONGRASS, CREAMY COCONUT, BLUEBERRY, PEPPERMINT, STRAWBERRY MINT AND FLAVOR FREE. Directions: Apply lotion in a circular motion, massage into skin, and allow your body heat to soak up all the nutrients.